Add a sculptural element to the table with this bowl, made from a single piece of chromed steel wire. 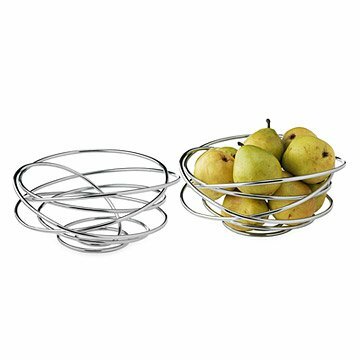 Made from a single piece of chromed steel wire, this sophisticated bowl adds a sculptural element to any table while serving a functional purpose. Elegant and modern, the swirling and curving lines seem to orbit around the contents inside. Showcase seasonal fruit, decorative objects or leave empty. Designed by the Anglo-Swiss design duo Dan Black and Martin Blum. Made in China. From a manufacturing background, Dan grew up discussing products and design with his family from an early age. His passion and skill for design was recognized in a first class honors degree from the respected Design for Industry course at the University of Northumbria (Newcastle). Dan gained further professional foresight working at IDEO (London). Frog Design (California) and under Julian Brown at Studio Brown (Bath). Dan completed successful group projects with his friend Martin Blum while studying in Newcastle, sparking the idea for the creative partnership that is now black + blum. "We are driven by the opportunity to give each design their own unique character and soul. Our brief is to create functional products that will charm and entertain." This is very unique. We purchased as a housewarming gift-the recipients spoke very highly of this bowl. gift for entertaining and display. Will be perfect on recipient's terrace dining table to fill with fresh fruit or most anything one is inspired to fill it with. Unusual and stunning. I filled this bowl with glass ball ornaments in various colors. Looks amazing! It would be pretty with holiday colors or fruit. This was a gift for my brother for Christmas. He loves it! He is currently using it as a fruit bowl and it is a good size for that. He is getting married this year and is in need of some nice things for his new house. This is perfect for that. Wild and crazy design - love it! This product was given as a gift. I cannot answer specific questions about its use, but the recipient was delighted, fascinated and immediately wanted to use and display the gift. If you like functional art this is the bowl for you. I was looking for something to keep fruit such as bananas and mango off the counter. This bowl looks beautiful full or empty.